This has been extended until July 24, 2012! Wow! 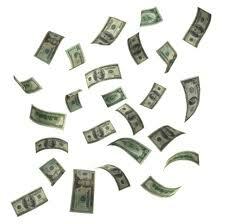 Who wants to win a huge cash prize? 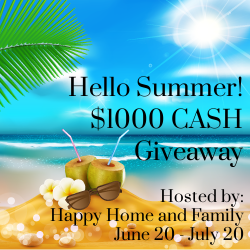 We are giving away $1,000 in the Hello Summer Giveaway! Happy Home and Family, Diva Fabulosa and a group of amazing bloggers have teamed up to bring you this amazing prize! Enter via the Rafflecopter entry form below. Good luck! I have some relatives that could use some of this cash and of course my local SPCA. Thanks! If I win I will pay down some bills and get my daughter a present for her birthday. Pay bills and put it in our saving towards buying a house! I would hope to use it to buy a crib and other nursery furniture. I would pay a big bill off. A laptop for my daughter and clothes for all the kids. Help toward my husband’s med. bills. I would pay on credit cards! it would help me pay for a car that my family desperately needs! If I won (fingers crossed) I would put it toward a weekend vacation to San Francisco which is only 3 hours away from where my family and I live. I would pay off some HUGE bills! I would get a new fence for the backyard with $1000! I will buy my mother a gift for her birthday next month. She has worked so hard overseas for many years now, and there’s never a time I gave her something prized. Go on a mini vacation. We realy need a small getaway break. Would like to visit the coast and see the ocean. Throw a block party for my neighbors to get to know each other! i would put this towards my rent. Pay bills and Christmas gifts! I would “stash” it in the bank to hive as a weddinng gift to my son and his fiance for their upcoming wedding! I would use it to pay for school! OMG I don’t stand a chance. I would use it for a disneyland trip. Buy some books, pay bills…. Down payment for a new car! Pay off hospital bills, just had a baby in January. I would buy clothes for the kids, and things for our new place. Thanks for the chance. I’d buy a new computer, I’ve been wanting one for what seems like forever! I would finish working on the remodeling of our 40 year old house. I would buy a computer which I need for designing. It would get set aside for a security deposit when we move! I would pay some bills and use some to go to Chicago to visit some friends. I would save my money to go abroad and study. I would help my mother with bills and/or save it for a car. If I don’t use it to pay bills, I may buy a badly needed new mattress set. Thanks for the chance to possibly do that through this giveaway. ***there is something wrong with Facebook Group #3 (Jens blah blah blog) It doesn’t open, also when I google search it, it doesn’t open there either. I am going to San Antonio at the end of August to visit my son’s family. I would use the money to fund my trip! Some towards bills and likely the rest towards a roadtrip! I would catch up on bills and fix my car. I would take grandchildren on a much needed vacation. I would start with getting my fridge running (I think the circuit board got fried). Then put the rest towards insurance and a vehicle. Save some, spend some on necessities, such as a new mop. I would put it towards my husband’s retirement fund! Help me pay for my car. Senior year especially because this year i have to drive to school with no car to drive in. I will help my daughter set up her 1st apartment! Pay some bills and spend some on my kiddos! Thanks for this awesome giveaway!!! If I win this huge cash, I would purchase online a vacation getaway for my family. since i got married we never had an out of town vacation. I want my kids to know how it feels to go out of the house and spend days outside enjoying and relaxing.. If I was lucky enough to win this, I would put a few hundred in my 3 1/2 month old son’s bank account. I would then pay two months of my car loan, and with any leftover I’d pay other remaining bills since my husband has been unemployed since February. I would pay off some debt. My mom and I have each lost about 30lbs so I would take us both shopping for new clothes!! If I win i am taking my kids on vacation! pay some bills including student loans, rent my own place and get some nice furniture! Bills, bills, bills and a little bit of shopping! I would treat my boys and hubby to a funfilled action packed weekend at Rotorua!! We never seem to be able to have a holiday so the weekend would be packed with things to do . Haven’t had a holiday in 7 years so would treat myself to one! I would take my family out for a special day, and pay some bills. If we won, we would put it to getting a second car because ours died this spring after owning it for 19years. I would spent it on a holiday. Use the money to learn driving from a driving school, don’t know how to drive a car yet…. Back to School Clothes for my sister! I would have to stock my linen closet with all new towels and wash cloths, buy more food storage containers for my kitchen, get each of my grandchildren a special toy,and something special for my two Boston Terriers and my kitty, Lily! I would pay bills and take my grandkids out to do something special. I couldn’t get anything to pop up on the ” Happy Home and Family” page at all so couldn’t like any of the thing from group 1 or 5. Need new tires for the car and pay bills – Thanks! Save it for XMAS! I’ve got a young niece that ain’t gonna spoil herself! YES! Who’d not LOVE this! I would use for my further education . Split it between my husbands & sons and let everyone get something fun. Buy a much needed and long wanted laptop!! I would use it to help pay the bills. I would take my kids to six flags or adventureland. I would spend it on my children. I will pay off bills. fix my kitchen sink, GOD BLESS AND KEEP YA’LL SAFE IN HIS LOVING ARMS. I’d probably use it toward a new sofa. Thanks for the opportunity to possibly do that. It’s off to the beach we go! I’d use it for college tuition. Trying to get my sisters family out where I live for Christmas. It is really expensive for her so it would help a lot to win!! I would use it for Christmas gifts and be so relieved!!!!!!!! I would shop until my fingers cramp. I would buy my Mom a new recliner and pay the rest to a bill. tHANK YOU FOR THE SWEEPS. i WOULD LOVE TO WIN THE $1,000. We would go on vacation! i will spend the money on fixing the transmission in my car. I’d buy a new computer and some clothes. I will save it for a house! I have a daughter and one on the way so it will be a big step to save up! I’d put it aside towards a vacation! I would give it to my mom because she deserves it . I would pay off some bills and use the rest for groceries and movie night. I would be able to afford a dietitian + fixing my husband’s car – sharing a car is hard! I would use the money towards a vacation for my family. I am losing my apartment at the end of this month. If I can’t figure out other arrangements, I will need to move several states away to stay with family. I would put that money towards my moving costs… because my pockets are growing cobwebs at this point. Put it towards a new air conditioner. If I won, I would use it towards bills! I’d use it on my art business! We need new furniture desperately so this would be a great start for us!! I would give it to my Son to help with his wedding! I would put it toward my school loans. I would spend a little on myself for my birthday which is today,the big 34.Then use the rest on the kids for back to school stuff. Would help out greatly!! give it to my mama.. she needs it. I will help put my daughter who just moved out. Boring i know, but i’d pay bills! I’d use it towards my road trip I’m starting in August! 🙂 Camping, fuel, hotels/hostels… it’s a low budget trip, so $1000 would be a loooot of money! I would pay some bills and do something fun with my kids, like a trip to the amusement park a few miles away! I would save half and spend the rest on Christmas gifts. Thanks! Put it towards a much needed vehicle since I dont have one. This would be a great start.. I would buy a king size bed for my bedroom from Amazon!! We have a queen now that is 4 feet off the floor and I hate it!! Especially with a toddler and a newborn within the month!!! I’d buy school clothes for my kids, and save the rest for Christmas gifts. Thanks for the giveaway…would buy a laptop for my daughter. I’d buy my sister a plane ticket here. I’d go shopping for things on Amazon & I’d finally get a passport so that I could leave the states. Are these people serious? Shopping for themselves and paying bills? Go to work!! I would give money to charities, especially to the Multiple Sclerosis foundation so they can find a cure for my brother and his MS friends. I would breathe a little easier! I would take my husband on a relaxing vacation because he really deserves it after serving in Iraq and Afghan he has now been made redundant from the army.I have just tarted my own business and work 16 hour days to get my new venture off the ground.